Table name must be unique under the database. Never start table name with numeric or special characters except underscore’_’. Do not use space in table name if we want give space in table name then use underscore symbol only. Every table name should contain minimum one character to maximum 128 characters. The maximum no. 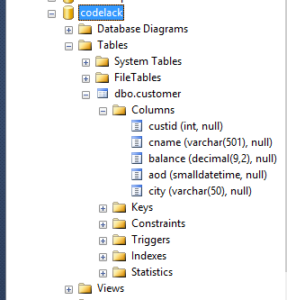 of columns a table can have 1024 columns. 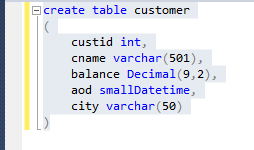 After creating the table if we want to know the structure of the table any time use the statement .